UpCloud uses a prepaid system where you can add balance to your account by making a payment at any time. Your services are then deducted from this balance on an hourly basis. 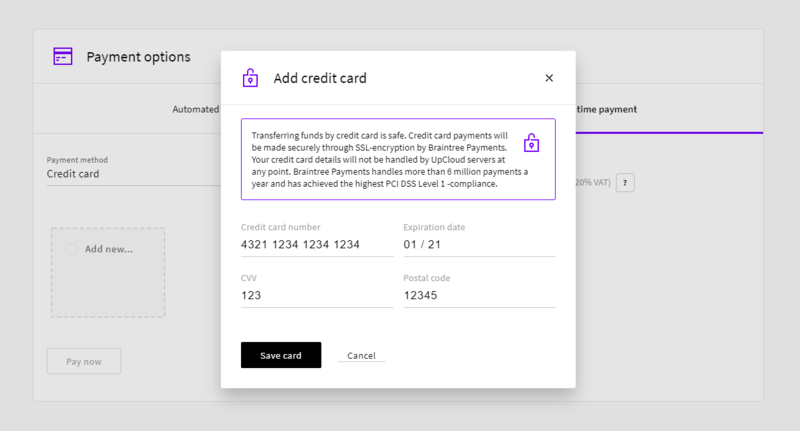 Below are explained our two methods for adding balance to your UpCloud account using a credit card or PayPal. The credit cards we currently support are listed in our accepted payment methods. We also have quick instructions for adding balance using PayPal, if you prefer paying with PayPal. The automated recurring credit card payments are an easy way to setup carefree payments and avoid running low on funds. 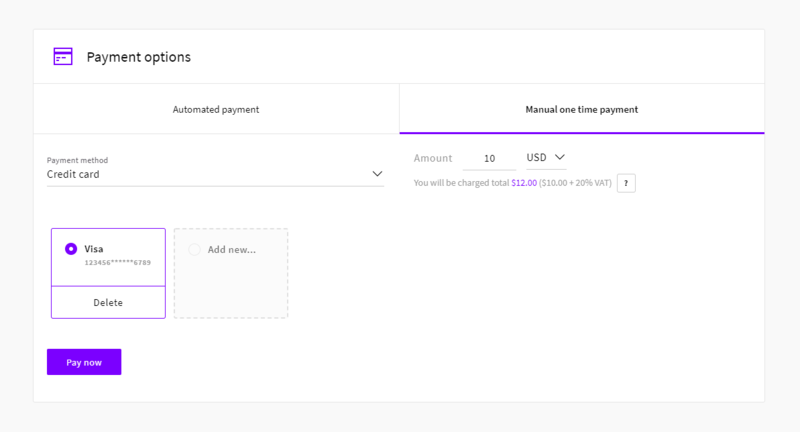 Unlike normal monthly subscriptions that simply charge once every 30 days, the UpCloud recurring payments look after your account balance, and only schedules payments when needed based on your usage and the limits you have set. Therefore, we recommend using recurring payments for reliable, hands-free management of your account balance. 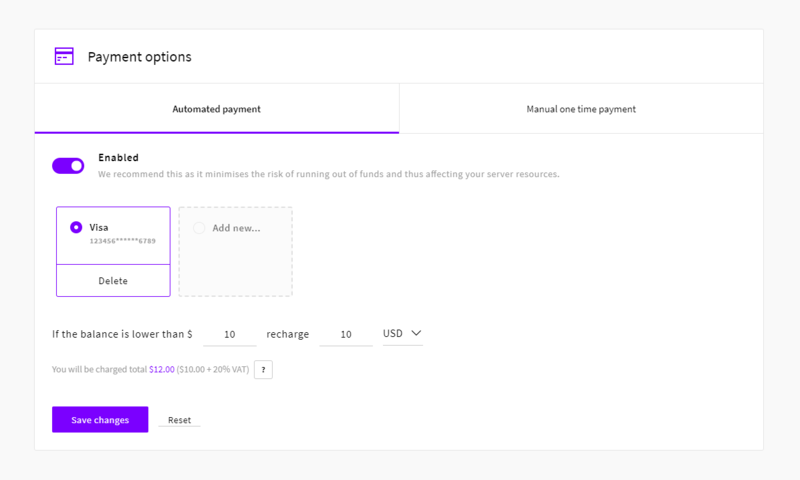 To configure the automated payments, log into your UpCloud control panel. Go to the Billing section in your Account and see the tab for Automated payment. Enter the amount you wish to add when your account balance goes below the limit you set in the previous field and select your preferred currency. Finally, click the Save changes button to confirm. With the automated payments, you will never have to worry about forgetting to top up your account balance. Depending on your current account balance and the limit you selected, you might not be billed immediately. But rest assured your servers will run uninterrupted providing 100% uptime for your web applications and services. When you decide during or after your trial that you wish to continue using your UpCloud services, you can upgrade your account to receive full access to all of our features by making a one-time payment. Making a manual payment and adding to your account balance is easy. First, log into your UpCloud control panel. Go to the Billing section in your Account and click the tab for Manual one-time payment. Then select from the options below. Once the payment is completed, your account balance is updated to reflect the amount you paid. Also if this payment was your first time adding balance to your UpCloud account, your account will then also have been upgraded for full access. You can add and remove credits cards saved to your account as needed. Log into your UpCloud control panel and go to the Billing section under your Account. Then in the Payment options, you’ll see your currently saved cards and the option to add a new card. When you click to add a new credit card, you will be presented with the new credit card form. Complete the form by filling in your credit card details. Then click the Save card button to confirm. Your credit card information is safely stored with our payment service provider Braintree Payments and listed under the payment methods. You can freely delete any saved card details if you wish through the controls on the Billing page. To continue our support for additional currencies both today and in the future, we will be including a 2% margin in the exchange rate shown if you make a payment in a currency other than the default, USD. This helps us cover some of the fees we are charged when supporting these currencies.